17 January 2017 – Tomorrow, 18 January 2017, prominent Emirati economist and academic Dr. Nasser bin Ghaith is scheduled for a new hearing before the Abu Dhabi Federal Appeal Court. UAE authorities have subjected Dr. bin Ghaith to a lengthy trial over charges that violate his right to free expression and association. Americans for Democracy & Human Rights in Bahrain (ADHRB) has recently received information that the Emirati government has deprived Dr. bin Ghaith of urgent medical treatment and has held him in conditions that fail to meet international standards for the treatment of prisoners. ADHRB strongly condemns the ongoing arbitrary detention and ill treatment of Dr. bin Ghaith and calls for his immediate release. In his most recent hearing on 5 December 2016, Dr. bin Ghaith was informed that his trial was being transferred from the Federal Supreme Court to the Abu Dhabi Federal Appeal Court. This transfer is pursuant to a modification in UAE law that now designates the Federal Appeal Court as responsible for handling state security cases. While the Federal Appeal Court will allow for an appeal of the trial’s verdict, whereas the Federal Supreme Court would not, this move also means that Dr. bin Ghaith’s trial will start anew on 18 January. Emirati authorities initially arrested Dr. bin Ghaith in August 2015 without charge, and they proceeded to forcibly disappear him for the next eight months. Dr. bin Ghaith’s whereabouts were completely unknown until he reappeared before the State Security Chamber of the Supreme Court in April 2016. On 18 May 2016, more than a month after his initial reappearance, Emirati authorities transferred Dr. bin Ghaith to the maximum security block of Al-Sadr jail. Reports indicate that, save for a total of two weeks, he has been held in solitary confinement at Al-Sadr since his transfer date in May. Officials have consistently prevented Dr. bin Ghaith from accessing a lawyer throughout his detention and trial, and contact with his family has been irregular. Dr. bin Ghaith has reportedly also begun to suffer from a serious medical condition that requires prompt treatment from a specialized doctor. Emirati authorities have failed to provide such treatment. In the rare event that Emirati officials have responded to bin Ghaith’s medical needs, they have failed to do so in a timely manner. It took several weeks, for example, for a doctor to examine Dr. bin Ghaith for pain he had experienced in his teeth; authorities have also been inconsistent in their provision of medicine that Dr. bin Ghaith takes to control his blood pressure. Dr. bin Ghaith has alleged that, during his disappearance, security forces tortured him by beating him, depriving him of sleep, and subjecting him to other forms of physical abuse. It is clear the Government of the UAE is failing to treat Dr. Nasser bin Ghaith in a manner consistent with international standards. 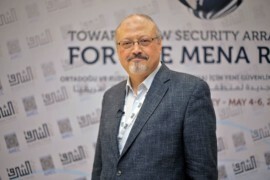 The UN Special Rapporteur on Torture has, for example, concluded that prolonged and indefinite solitary confinement amounts to cruel, inhuman, and degrading treatment and should be prohibited. The government’s failure to provide Dr. bin Ghaith with adequate medical care, as well as its failure to guarantee him consistent access to his lawyer and family, violates a number of provisions of the UN’s Standard Minimum Rules for the Treatment of Prisoners. Dr. bin Ghaith’s claims of torture suggest that the UAE is additionally in violation of the UN Convention Against Torture and Other Cruel, Inhuman, or Degrading Treatment (CAT), to which the country acceded in 2012. Moreover, Dr. bin Ghaith faces trial for crimes that relate to his exercise of the right to free expression and association. Several of these charges stem from comments Dr. bin Ghaith made on Twitter that were allegedly critical of the Egyptian government; under Article 166 of the UAE Penal Code, such criticism can constitute a “hostile” act against a foreign country and carries a maximum penalty of 10 years imprisonment. The authorities brought a separate charge relating to a tweet in which Dr. bin Ghaith is said to have “offensively criticiz[ed] the construction of a Hindu temple in Abu Dhabi” under the UAE’s 2012 cybercrimes law, which criminalizes the online publication of material intended to harm the reputation of the Emirati state or its leaders. Dr. bin Ghaith is also charged with posting information “intended to damage the UAE” by “claiming that he was tortured and unjustly accused during a previous trial.” This refers to comments he made online regarding the 2011 trial of the “UAE 5” – a group of Emiratis, including Dr. bin Ghaith, who were convicted of and then pardoned for publicly insulting the UAE’s Crown Prince Al-Nahyan. The trial was determined to be “fundamentally unfair” by human rights organizations. Finally, Dr. bin Ghaith faces charges relating to his alleged association with two parties, Ummah and al-Islah, classified as terrorist organizations by the UAE. The authorities have brought these charges under the country’s broad counterterrorism law, which has come under international scrutiny. The UAE has also targeted those associated with al-Islah in the past: in the case of the “UAE 94,” Emirati courts convicted 69 of 94 defendants with links to the group of attempting to overthrow the Emirati political system. In reality, the charges appear to relate solely to the defendants’ exercise of their right to free expression and association, and the prosecution relied on forced confessions from two of the accused. The UAE’s ongoing trial of Dr. Nasser bin Ghaith and the conditions of his detention violate international human rights law. In addition to his disappearance and his mistreatment in detention, Dr. bin Ghaith’s prosecution violates the right to free expression and association as expressed in the Universal Declaration of Human Rights (UDHR). The actions of the Emirati authorities also violate the protections offered by the International Covenant on Civil and Political Rights (ICCPR), though the UAE has not acceded to this treaty. ADHRB condemns the continued arbitrary detention and ill treatment of Dr. Nasser bin Ghaith. We call on the Government of the UAE to ensure Dr. bin Ghaith’s immediate release and to drop all charges against him. We additionally urge the government to release all prisoners of conscience and to guarantee the freedoms of expression and association in the UAE.